Quick summary: In this lesson, students will explore key characteristics of healthy lifestyles including healthy eating, physical activity and rest. They will use a range of modes to practise and present their learning, including through singing, drama and illustration. They will then create a puzzle which shows a healthy habit to share with their classes and students in future years. Students are aware of key attributes of a healthy lifestyle. Students create visual representations of ideas to communicate them to an audience. Syllabus outcomes: MOS1.4, DMES1.2, PHES1.2, PSES1.5, ALES1.6, PHS1.12, SLES1.13, VAS1.1, VAS1.2, ENe-1A, ENe-4A, ENe-6B. ENe-10C, EN-11D. General capabilities: Literacy, Numeracy, Critical and Creative Thinking, Personal and Social Capability. Relevant parts of Foundation Health and Physical Education Achievement Standards: Students recognise how they are growing and changing. They identify and describe the different emotions people experience. They identify actions that help them be healthy, safe and physically active. They identify different settings where they can be active and demonstrate how to move and play safely. They describe how their body responds to movement. Students use personal and social skills when working with others in a range of activities. They demonstrate, with guidance, practices and protective behaviours to keep themselves safe and healthy in different activities. They perform fundamental movement skills and solve movement challenges. Relevant parts of Year 1 and 2 Health and Physical Education Achievement Standards: Students describe changes that occur as they grow older. They recognise how strengths and achievements contribute to identities. They identify how emotional responses impact on others’ feelings. They examine messages related to health decisions and describe how to keep themselves and others healthy, safe and physically active. They identify areas where they can be active and how the body reacts to different physical activities. Students demonstrate positive ways to interact with others. They select and apply strategies to keep themselves healthy and safe and are able to ask for help with tasks or problems. They demonstrate fundamental movement skills in a variety of movement sequences and situations and test alternatives to solve movement challenges. They perform movement sequences that incorporate the elements of movement. Relevant parts of Foundation English Achievement Standards: Students use appropriate interaction skills to listen and respond to others in a familiar environment. In informal group and whole class settings, students communicate clearly. They retell events and experiences with peers and known adults. Relevant parts of Year 1 English Achievement Standards: Students listen to others when taking part in conversations, using appropriate language features and interaction skills. They interact in pair, group and class discussions, taking turns when responding. They make short presentations on familiar topics. Relevant Parts of Year 2 English Achievement Standards: When discussing their ideas and experiences, students use everyday language features and topic-specific vocabulary. They use a variety of strategies to engage in group and class discussions and make presentations. Level of teacher scaffolding: Low – Content will be discussed and revised explicitly and the student independent task is open-ended in nature allowing for freedom and creativity. Resources required: Device capable of displaying video. Coloured pencil sets containing a variety of skin tone colours. One copy of the Jigsaw Planning Template for each student. 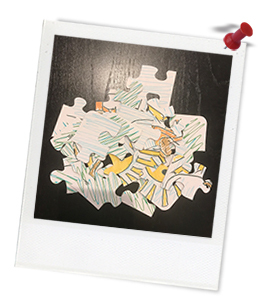 Blank jigsaws such as Colorific Jigdraws (one per student). Press seal bags (one per student). Keywords: Healthy, health, wellbeing, healthy living, healthy lifestyles, healthy eating, exercise, physical activity, rest, sleep, mental health, puzzle. ... list various aspects of a healthy lifestyle. ... give examples of foods that can be included in a balanced diet. … identify the importance of rest and relaxation. 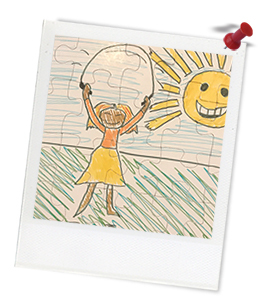 … develop a representation of an active lifestyle to promote positive choices to others.